First sketches of Mac and Robin, before any story about them was written. The slogan on Mac’s shirt (at right) was cribbed from a line in an episode of The Young Ones, later to be simplified to the “No Crap” symbol. 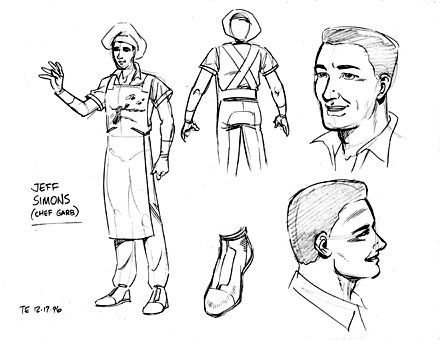 Left: the first concept for a Barbarians pilot suit, which was later broken up from a unitard to a two-piece. 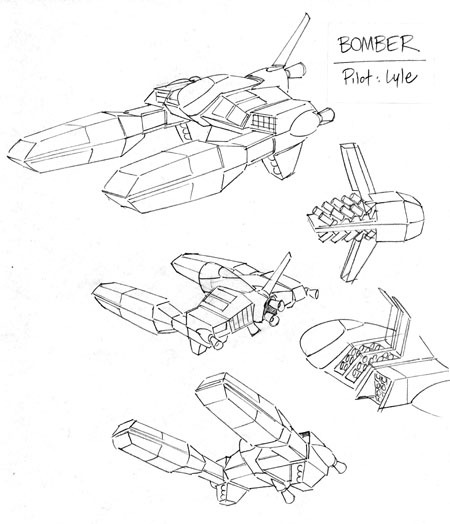 Right: the F-300 fighter evolves over two pages of sketches. The task for this story was to depict Robin’s rite of passage, his initiation (with all its requisite pain) into the new life that stretches out before him. What surprises me the most about this episode is how closely it follows the structure of the classic hero’s journey myth. I wasn’t introduced to the works of Joseph Campbell until a few years after I wrote this, but all the traditional motifs are here. Robin is still held back by the constraints and preconceptions of his old sphere of existence, represented by his increasingly obsolete attachment to Kevin. Mac is the shaman who has to guide Robin – by whatever means necessary – through a death and rebirth. Robin has to break the chains he was born with. As a writer, I instinctively knew these things had to happen, but I was completely unaware of how universal the concepts were. Now that Robin and Mac had overcome their initial teething pains, it was time for them to take a step into their surrounding environment. The Fist of Earth, after all, is a colorful microcosm of all manner of deviants, rogues, and monsters. I should probably explain that although it’s a ship of war, it isn’t at war yet. Everybody has a job to do, but they can also relax and let in some comedy. After years of writing hard-edged SF dramas, it was quite liberating to discover this. Robin does in this story exactly what I would do if I suddenly found myself surrounded by women like the Barbarians: lose my cool, my confidence, and any semblance of self-esteem. Unlike me, however, Robin has a highly sensible and infinitely devious benefactor on his side. And next to some of the other human males on the Fist of Earth, Robin is a standout whether he believes it or not. By this time, I figured any readers who were hooked by the first four stories deserved something of an explanation for exactly what happened to the Earth and why intelligent gorillas are bunking with human beings. I also knew I wouldn’t be satisfied with Grease Monkey until I found some way to render a profile of Mac looking heavenward. Something about that image stuck in my mind as a symbol for the particular sense of wonder I wanted the series to convey. No doubt about it, of the first six episodes this one is my personal fave. When this story came out of my pen, I wished all these characters were actors so I could send them flowers after their masterful performance. After this one, the story had taken over and I no longer considered these to be fictional characters. I was just the guy holding the pen, reporting on their lives. Ask any writer if they are in control of their characters, and they’ll tell you a similar story. I dearly hope that two things from our time will still be around in a future of space travel. First, I hope there are still books that you have to pick up and open to read. Even though it makes more sense in a closed environment to store all your text electronically, I doubt that any piece of literature would have the kind of weight – and meaning – that it gains by virtue of taking up physical space. Second, I hope that being surrounded by ultra-high-tech hardware and exotic circumstances will not supplant a hearty taste for science fiction adventure. Even now, most of us don’t get excited about stories centered on what surrounds us in our daily lives. These two thoughts tugged at me as I created this story, and I cheerfully addressed them both. Fist of Earth‘s library contains digital books, but they each demand their own package, unwilling to be denigrated. And when Robin declares that the ship is full of stiffs, he is observing precisely what happens when people lose their appetite for imagination. Kara is a casualty of this, someone whose creative mind serves little purpose to the society and goes to waste by running itself in circles. Let’s all promise each other we won’t let it come to this, okay? Few obstacles in life are as insurmountable as our reactions to them. Whoever learns how to manipulate our reactions will be the true master of the world. In the time since I wrote this one, that has become more and more obvious. Trivia: Wes was named after my brother-in-law. This story has a bit of a checkered past. As a fervent NASA supporter, I wanted to be completely accurate in my depiction of a next-generation space shuttle, which for the longest time looked like it would be the X-33 Venturestar. Ever since I wrote this script in 1996, I was on the lookout for X-33 references, but I was never happy with what I found, not to mention annoyed by the ship’s lack of a human crew. This had me stymied for three years until NASA (bless their hearts) rolled out the X-38, a smaller shuttle designed as an escape vehicle for the International Space Station. The shuttle that appears in this episode isn’t exactly the X-38 (its aerospike engine should be a dead giveaway to those in the know), but it’s founded on the same concept, which serves this story far better than the X-33 ever would. Besides, it was announced as I was drawing this story that the X-33 project was finally being scrapped after five years of study. Nonetheless, I hope something like it does eventually fly – with humans at the helm – and that people like Captain H.E. Peffard are among them. Special thanks to my pal Glenn Swanson at the Johnson Space Center for reference on the vitally important SAFER unit! Political correctness gets a bad rap these days. I see it as a much-abused idea with noble roots. If you accept that words and thoughts can be the same thing, then changing the words we use can have a strong impact on how we think. We struggle mightily against modes of thought that are forced upon us – as well we should – but since we humans have gained a virtual stranglehold on the planet, I think it behooves us to recognize that little will improve until the quality of our thoughts improves. If that means paying closer attention to the words we use, then so be it. So far, it seems to be an inescapable truth that within any group you will find at least one obnoxious jerk who seems unaware of, or uninterested in, the effect they have on the people around them. You know the type. A human hemhorrhoid. One whose primary function is to make life harder for everyone else. If this is indeed a given pattern in human affairs, we can do one of two things in response: either compromise ourselves into ambivalence, or try to find a purpose in it. My thinking is that human obstacles are here to teach us more about ourselves, to heighten our awareness of the impact we have on each other’s lives. And if that doesn’t quite work, they can at least give us an excuse to sharpen our wit and sarcasm (two of humanity’s most vital resources, if you ask me). When I wrote the first six episodes in 1992, they sort of naturally fell into a story arc culminating with Mac almost getting a date with Admiral Stettler. When I made up my mind to write more episodes in 1996, it felt right to construct the entire series this way, in arcs of six stories that would each end with a follow-up to “Rewards.” And I have to say that although each story is special to me in its own unique way, these episodes stand out because they pretty much wrote themselves. It’s an undefinable kind of magic when your characters tell you what’s supposed to happen to them, like the thing you created is alive and independent of you. It’s just like all the best moments of being a parent, and I wouldn’t trade the experience for anything. when my daughter was a kid, she went through occasional bad patches where nothing was fair and she never got her way and everybody around her was mean for no reason. One summer, she and I took a weekend off in a major American city (I won’t say which one) and wound up staying in a shabby hotel on the anarchic side of town. Lots of homeless people, an atmosphere of violence, and oppressive cityscapes were just some of the highlights. In the midst of this, she turned to me and said, “You know what, Dad? I really like my life.” Until that moment, I hadn’t quite realized how valuable it is to have context. Since day one of this project, I’ve always puzzled over how much I want to make Mac and the others like real gorillas from our time. I’ve often worried that they just come off as humans in ape costumes. Beyond the cheap banana jokes and monkey puns, there ought to be many subtle and complex levels of gorilla behavior. As it turns out, they were subtle enough to sneak into the fabric of the story on their own. First, gorilla troops consist mainly of females grouped around an alpha male and one or two juvenile males, precisely the makeup of Barbarian Squadron. Also, since the female gorillas choose which male to join up with, he has to audition for the role. He has to show leadership and responsibility in order to win the ladies’ approval. Which is precisely what Mac does in his long-term attempt to impress and charm Admiral Stettler. So the gorilla culture as we have come to know it is in there, it just took its own subtle and complex route. Believe me, I’m as surprised as anyone by this. By the way, the philosophy in this story has helped me to cope with some interesting times. Who knows, maybe it will help someone else. Here was a genuine case of history overtaking me. When I originally wrote this story, it included this line as part of the VR movie: “Only twice before had humanity been touched by such power.” The two events were the first atomic bomb explosion and the first moon landing. To me, it seemed that nothing could compare with those two utterly different but equally significant moments in history. But that was before September 11, 2001. It occurred to me on that horrible day that my concept of a worldwide alien attack would look something like what happened in New York. But, of course, it had the built-in buffer of being fictional. I drew this story a month after 9/11, and it already seemed historically inept to stick with the original script. I’m hoping I won’t have to revise it in the future to accommodate something worse. 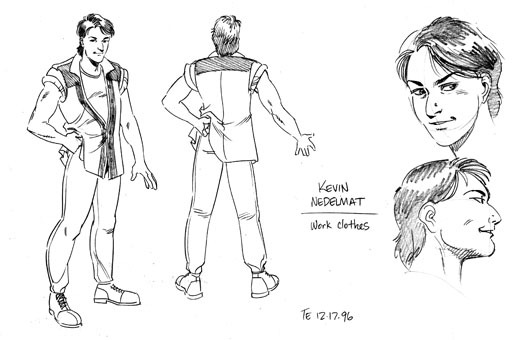 During the first half of the 1990s when I began this project, a few of my contemporary comic book creators suddenly received explosive popularity in return for what looked to me like not very much effort. Those of us in the larger sector of the art form (the lesser known but harder working) kept our heads down and toiled onward, quietly resenting the hell out of this paradox. I know I’m not the only one in the world who believes that reward should be commensurate – not reciprocal – to the time and effort you give to your work. When evidence piles up in support of the opposing theory, when it looks like the manipulation of easy formulas is the fast track to both financial and creative success, you begin to question some of your fundamental beliefs. Some of us were irresistibly tempted, and jumped onto the bandwagon. And nearly everyone who did dropped out of sight afterward. We should all have realized how hollow it actually was. Observing this led me to my short road vs. long road ethic, which I hope I’ve mapped out clearly in this episode. Perhaps an amusing coda is that this particular story was the most difficult of them all to draw, and it refused to be contained in my preferred 12 pages. In other words, I had to work harder to tell a story that applauds hard work. I won’t go on and on about the real-life influences in this story, because I find it’s much better when you can be pointed toward great books and ideas with minimal hype. Instead, I will sing some praises. When I wrote this one, I deluded myself into thinking I could draw the whole thing myself and adjust my style slightly for “the comic within the comic.” With time came wisdom, and when I finally dissuaded myself from the notion I had to figure out who else could do it. This led me to my pal David Hartman, a wicked genius if there ever was one. (Visit his website here.) He also pays his bills as an animation director. His work contains the same wit, irreverence, and silliness with which he lives his life, and he was my first and only choice to stand in for the fictional E.C. Laurels. The writing and layouts are mine, but every grain of character and texture are pure Hartman. I hope you enjoy it as much as I do. I’m gonna go out on a limb here and predict that unless somebody invents telepathy, boys will always find the workings of the female mind a complete mystery whether it actually is or not. Moreover, I’m gonna predict that even when the answers to their most fundamental questions are sitting right in front of them, people will still insist on looking for something else. Try as we might, we still prefer the chase over the prize. But that’s okay, because very few of us know what to do with the prize once we’ve got it. I wish there were more myths about that. This was the single toughest story for me to write. Most of the previous scripts were written at a breakneck pace, which came to a screeching halt on this one. It was because I had only a meager grip on the character of the fathers, and looking back, I realized that I had no template to follow. Most of the men in my family did not flow with great passion, and I simply didn’t know what it would be like to live with that. After about a month of creative constipation, I gave up the research angle and just put the two fathers together in their first scene. Imagine my surprise when the finished script clocked in at twice normal length! Those guys just took the stage and ran with it, exhausting everyone in the process. In the end, this probably gave me the experience I lacked before. Although this story was written shortly after the ’96 presidential election, the political views I built into it turned out to have a lot more relevance in later years. If these views are still relevant in a hundred years or so, we will have a lot to answer for as the caretakers of democracy. There comes a time for all of us when larger forces (vast, cool, and unsympathetic in the words of H.G. Wells) emerge from silence and cast strange, discomforting shadows over our lives. I imagine that each of us has known a time when our fates were suddenly, frighteningly, placed in the control of someone who had little notion or concern about the power they could wield. Bank manager, landlord, employer, whatever. Sometimes it doesn’t take much to crack our armor and make us feel insignificant. This is what happens when a system becomes more important than the people it was meant to serve. You won’t find many laughs in this story, because it’s a topic I don’t find terribly amusing. At last, the payoff. What I like best about payoff stories is that they are usually so unique to their context that no other combination of elements could have created them. One of the best things about a payoff story is that it can give a writer genuine opportunities for wish fulfillment. In this case, I had two wishes; that your friends will come to your rescue when you need them the most, and that once in a while your leaders actually do know what they’re doing. I think those are wishes we can all get behind. Okay, I’ll come clean. The whole reason I did this book was so I could draw that one page of Mac & Evelyn in the park. There. I said it. At right is the bomber, which makes its first appearance in Episode 24 as a setup for its heavier use in Book 2. 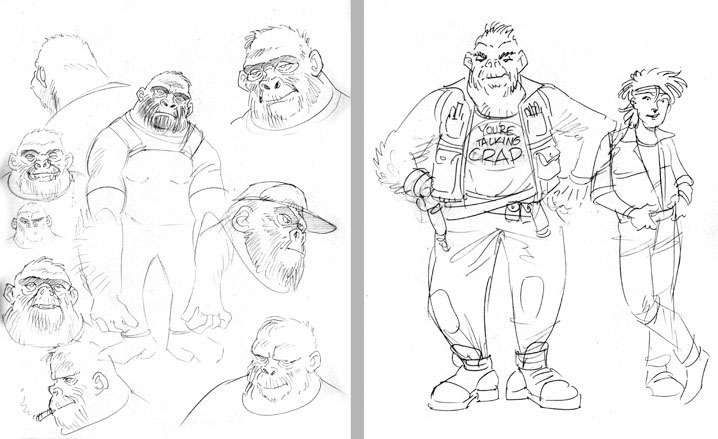 It was first designed for the Grease Monkey animation pitch, which can be seen here. After I wrote the entire Robin meets-and-loses Kara storyline, it all happened to me in real life. The details were different, but the impact on me was the same as on my paper persona, and my reaction was (naturally) just like his. I wrote this in response, bringing together a little formula for dealing with life that still works when I remember to apply it. By the way, my Kara came back to me a couple of years later. Maybe someday the same will happen to Robin. I almost always listen to music or have some riff going through my head while I draw. Music is such an energizing, inspirational, creative force, I can’t imagine getting through a workday without it. This made me want to find some way of including music in a comic strip, other than a playlist no one would have a use for. So here it is: YOU pick the music. When you read this story, you can play your own favorite piece behind it (preferably something classical) and maybe you’ll get to have the same experience as Robin. One year I visited the San Diego Wild Animal Park and was stunned when the tour guide claimed that wild African gorillas were now extinct. It felt like someone had kicked me in the stomach, as if a family member had suddenly died. Gorillas were endangered when I started writing these stories, but it never occurred to me that these most magnificent creatures wouldn’t be around by the time I finished. Fortunately, I was able to learn from the fine people at the Dian Fossey Gorilla Fund that this tour guide was, in fact, exaggerating. The mountain gorillas of Rwanda are most definitely in trouble, but lowland gorillas can still be found in the thousands. So there’s a bit of a relief. Anyway, I cooked up this story while I wandered around the park that day, sick with the shock I felt upon hearing the “e” word and feeling very raw toward my fellow human beings. My mood has improved since then.